This is one of those books where you have to have your wits about you. 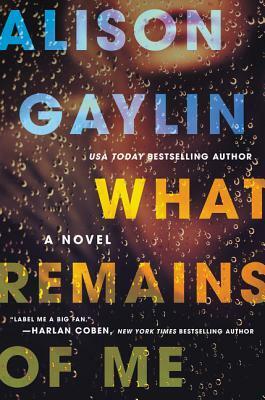 There is a lot to comprehend and digest, a lot of clues and information disguised cleverly in contrived sentences where the author knows exactly what she is doing, but that is the beauty of a thriller and this author definitely delivered. Hollywood is notoriously full of influential people, holed up in their multi-million dollar houses, cavorting around with god knows who and who knows where. Where fame and fortune is paramount to social acceptance and it is definitely not what you know but who you know. Alison Gaylin portrays this perfectly as the children of the Hollywood glitterati get caught up in the parties, booze and drugs that leads to questionable decisions and actions. This book is told through the voice of Kelly Michelle Lund, a convicted murderer that has since been released from prison. The time line flits back from past to present as the past details the events leading up to the then seventeen-year-old girl that committed the most heinous crime, the murder of famous movie director, John McFadden. One where she showed no remorse and where the paps caught a smirk for which she will forever be known… “The Mona Lisa Death Smile” was forever immortalised in picture and print. The present is Kelly stuck in a seemingly loveless marriage, holed up permanently as she battles to shed the stigma that surrounds her even after all this time. When her father in law, Sterling Marshall turns up dead in similar circumstances to his best friend, John McFadden all eyes once again turn to the “Mona Lisa” murderer and Kelly once again finds herself thrust into the media spotlight for all the wrong reasons. The media have already tried her and found her guilty, the police are hot on their tails trying to prove it. For me Kelly was totally misunderstood and for once I actually found myself rooting for the murderer. With the flashbacks to the past I found myself constantly contradicting myself and reading in between the lines as my common sense constantly picked at what I was reading. I found myself consciously picking apart things and found myself questioning the validity of her first conviction. This book is full of red herrings, ones that I am now rather fond of, because it was this that made this unputdownable. Hollywood is born and raised on secrets, everyone has them, everyone uses them to their advantage but some are born from love and are taken to the grave. Kelly was a young girl striving for acceptance, for a sense of belonging to someone. To be someone’s friend, confidante and lover. This pushed her into circles her mother warned her about and ones that had ultimately taken the life of her sister, but Kelly pushed on for that one thing she had always wanted, yet ultimately cost her…her freedom. Alison Gaylin cleverly creates one hell of a tangled web and she is the spider surreptitiously awaiting you to fall victim to her trap. With twists and turns aplenty this story will give you whiplash and will definitely have your grey matter working at the rate of knots. For me, I couldn’t put this down, I was frantic to know not only who had killed her father in law but also how she came to be convicted of murder the first time. Nothing is ever as it seems. I loved this book and I cannot wait to read more from this author. My current drive in the crime thriller genre shows no sign of abating.